It was so hot last Wednesday that it made for a quiet day at work. No one wanted to leave the air-conditioned comfort of their offices for surprise drop-by meetings, invitations to coffee were put on hold because the idea of drinking something hot was unbearable, and the in-office talk was mostly about the heat advisory, the air quality advisory, and the fact that the heat index was over 105 degrees. Not surprisingly, 100-degree weather made my commute to and from work the worst part of the day because Washington Metropolitan Area Transit Authority is incapable of running metro trains with working air-conditioning. By the time my ride was over, I was sweaty and miserable. All I wanted was to be in the condo with a glass of white wine. The 2010 Sawtooth Winery Riesling (winery) was a pale straw-like yellow with a few small bubbles clinging to the sides of the glass. On the nose, there were ripe stone fruits, mostly peaches and nectarines, followed by a hint of white flowers, honey, and minerality. In the mouth, there were peaches, Lemonheads candy, honey, and flowers with a hint of minerality. The wine had bright acidity, a touch of sweetness from the residual sugar, and a bit of a spritz. Is this worth a glass after work? Definitely! If you see this wine in the store, grab it; you won’t be disappointed. At $10, this wine is well-balanced and delicious with a fabulous quality/price ratio. One of the Wine Ladies that I get together with on a monthly basis recommended this wine. To be honest, when I saw that it had a touch of sweetness and that it was from Idaho, I was skeptical, but she was absolutely on target. 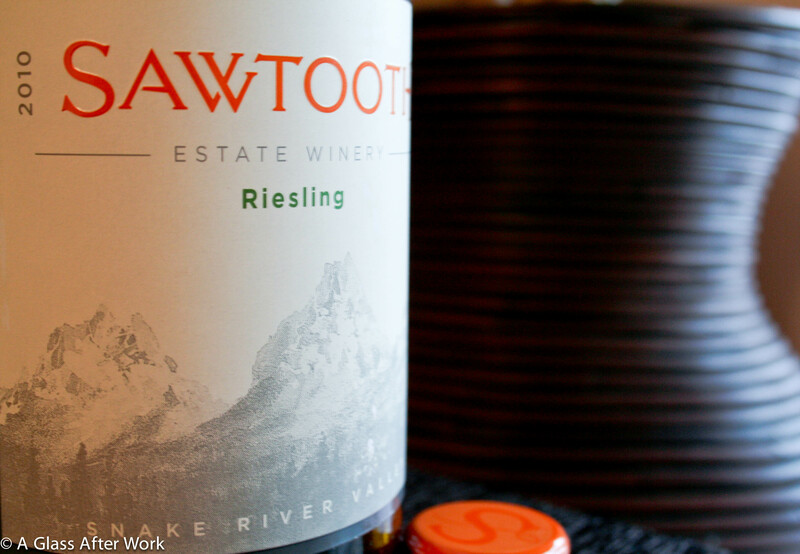 It was light-bodied, refreshing wine that packed a flavorful punch without being too sweet. While it could probably pair nicely with a spicy Thai dish or with Chinese, this is a wine that is perfect all on its own. Question of the Day: What’s your favorite thing to drink during a heat wave? Been a long time but hope all is well, Interesting this wine is from Idaho which is not what you think of as wine country. It has been a while! Things here are going well…hope the same is true for you. I never thought of Idaho as wine state either, but this one is certainly worth tasting, as it will change your mind. The winery is not that far from the Oregon/Idaho border, so I think this part of the state is a little more likely to see some of the same weather that helps make great Oregon wines.